Businesses that continue to look solely to governments for salvation will ultimately be bitterly disappointed. History is our best teacher, and there are already plenty of lessons in the business networks of the past – says Vivek Sood, an internationally renowned business guru. In his new book, The 5 Star Business Network, award-winning author Vivek Sood explores the best of what can be learned from business networks spanning thousands of years, converting historical lessons into powerful themes and lessons for the corporate world. Mr Sood is available for immediate comment and interview. What does history teach business people? Is there a lesson within the archives of history that will show way out of the current economic situation? What can we learn from the example of the East India Company – the world’s first multi-national corporation? 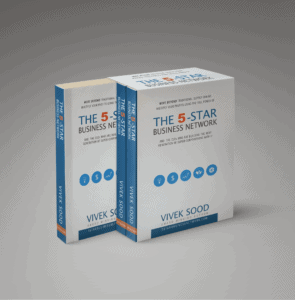 Award-winning author Vivek Sood answers all of these questions and more in his new book, The 5 Star Business Network. He takes the reader on an engaging journey from the ancient silk route to the modern corporate world, nimbly demonstrating the reasons behind the rise and strength of business networks, and showing businesses how they can use these historical lessons to improve their efficiency, reduce their risk and enhance the robustness of their companies. The 5 Star Business Network is available for purchase from April 2013.
Business leaders should look to history not the governments for a way out of the current economic morass says the business guru from this statement what you are actually supposed to say ? to whom you are targeting? It’s great to hear about award winning 5 star book written by Mr. Vivek. Should I get full version of it by anywere?